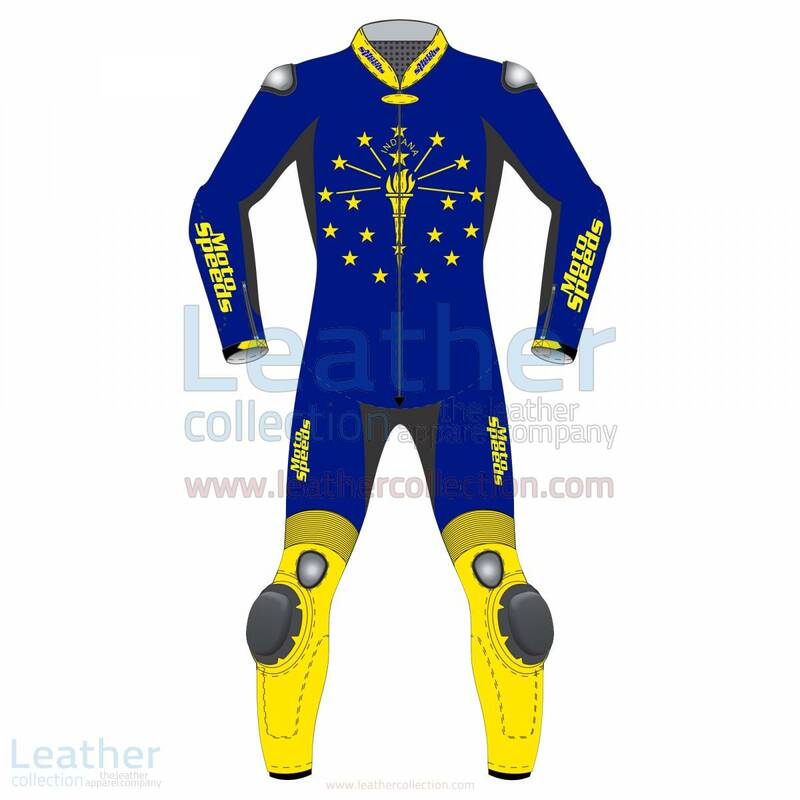 Indiana flag motorbike racing suit, A one of the patriotic designed motorcycle suit with promising extra modified features related to protection from accidental abrasions and cuts. Made under proper supervision keeping the comfort and safety of the rider in mind. Indiana Flag Motorbike Racing Suit Safety Features Motorbike racing suit is designed & tailored using the race geometry with latest high performance safety materials and advanced construction techniques Premium full-grain leather for excellent abrasion resistance. Kevlar stretch is used in motorbike racing suit for maximum movement with protection. Accordion leather stretch panels on elbows, lower back and knees improve flexibility and riding comfort. CE approved Armour on shoulders, forearms & knees. Aerodynamically sculpted racing speed hump, specifically designed for back protection in all conditions. Removable dual density spine protector. TPU moulds on shoulder & knee. Interchangeable Knee Sliders. Rubber padding on Bicep, hip and tail bone. Motorbike racing suit is Multi-row stitched with high-strength nylon thread. Racing Suit Construction Racing suit made from genuine cowhide top grain leather 1.2 to 1.4 mm for excellent abrasion resistance properties and is extremely durable.